There’s a slight sense of urgency underlying the many exhibitions that have recently popped up exploring the historical phenomenon, and of-the-moment utility, of the photography-sculpture hybrid as an art form. And it’s not entirely surprising that the art world is actively revisiting the physical manifestations of photography at a time when hardly anyone prints photos out anymore—why waste the paper?—prefering to store their images on social media and the cloud. Once upon a time, of course, a photograph was more than bits of digital information; it had to be physically made by hand, and, because of that fact, a photograph had an inherent physicality it now lacks. Now this aspect of the medium’s history is suddenly of interest for younger artists working from the perspective of digital technology today. From the very beginnings of photography’s development, artists have been intrigued by the materiality of the photograph, and have experimented in the gap between the photo as an image and the photo as an object. In 1859, French painter, sculptor, and photographer François Willème made what he called “photosculptures” of people by putting his subjects on a platform surrounded by 24 individual cameras, the lenses spaced 15 degrees apart in a sphere. The individual photos taken by these lenses were printed, then re-assembled to create a three-dimensional portrait of the sitter. Why, then, is there suddenly renewed interest in this hybrid art form now? And what kind of possibilities does it hold for the future? Here area a few ways of looking at the phenomenon. Photo-sculpture hybrids challenge the typical status of the photograph as a piece of ephemera, something relegated to secondary status as compared with an original painting or drawing. The truth is, we never quite reconciled photography’s infinite reproducibility with its relatively recent designation as a fine art, relying on the somewhat cynical model of “vintage” and artificially limited-edition prints to drum up the same sense of aura that other two-dimensional fine art forms derive from their singularity. This is the model that rules the fine art photography market of today, despite the fact that digital technology has nearly perfected the art of lossless image reproduction. It is perhaps in part because of this attitude that the Museum of Modern Art’s 1970 exhibition “The Photographic Object” was received as an odd outlier in comparison with the sleek minimalist sculpture and conceptual work that was popular at the time. Now, however, the show is being re-explored as an important moment when artists were considering the photograph’s materiality and investigating ways of cross-pollinating the photography and sculpture worlds. Hauser and Wirthrecently mounted a partial re-creation of the seminal MoMA show its gallery on East 69th Street in Manhattan; meanwhile, the gallery’s downtown location is host to “Fixed Variables,” a contemporary reboot that features work by artists engaged with similar concepts today. Meanwhile, MoMA itself currently has a retrospective of Robert Heinecken’s works, including the photo-puzzle pictured above, and New York is seeing numerous exhibitions at galleries like Bruce Silverstein and Andrea Rosen that are investigating the potential of photography to do something other than faithfully create an illusion of reality. 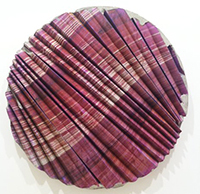 More recently, artists have been less concerned with using photography to recreate objects in three dimensions and more interested in taking up photographs as sculptural materials. Some strategies treat the photograph as a “skin,” in the sense of a digital graphic stretched over a 3D model, as in Jordan Wolfson‘s decal-plastered lobster claws. Others, like Letha Wilson, mix photography with minimal sculpture. The photograph, in other words, is being treated less as an object and more, in the face of digital innovations, as a way of projecting images onto real space. A “skin,” of course, is also a kind of mask, and works like Wilson’s derive their oddity from the confusion between the image and its support. Faced with these works, one can never be sure exactly what one is looking, with the two-dimensionality of the photographic image taking on the three-dimensionality of a real thing. To speak about the future of photography is tricky. As the medium has become a function of digital technology, we’re already seeing the result of even further degradations between images and objects that reach beyond traditional understandings of photography’s role, especially when the fine arts are involved. Take, for instance, the Dutch company FormArt, which is developing technology that would allow museums to make three-dimensional digital scans of a painting, meaning that not only the colors on its surface but also the texture and depth of its brushstrokes could become reproducable, “printable” pieces of information. (The Van Gogh Museum in Amsterdam has, in fact, already begun producing limited-edition 3D prints of masterpieces from their collection, which currently sell for $30,000 each.) Can we, in fact, call a 3D print of a painting a kind of photograph? On the other end of that spectrum, Liz Deschenes creates photograms by exposing photographic paper over an extended period of time, with the resulting works looking very much unlike the typical expectation of a work of photography. The medium is being pushed to its limit, it seems, in both directions. The question is, is there a point when it stop being photography and becomes something else altogether?